I just recieved two referee reports with my proof. Strange, that seems sorta late for me to be editing the content of my paper. Thank goodness the comments are generally positive. First, we received only one referee’s report, with very little to change. That’s actually not very helpful, because I don’t know what parts of the paper need changing. And then we received a late referee report, right when we were about to submit our revision. Now we’re getting two more reports at the proof stage. Of course, I’m happy that the editors sent us these referee comments, so I can fix things. (I wish the editors of another journal had sent my referee notes to the authors!) Nevertheless, maybe the editors should have waited an extra few weeks before telling us to start making revisions (it was a very fast turn-around). But it could be my own fault, for submitting an invited paper a couple weeks later than the editors asked. That’ll teach me. Great paper in Angew. 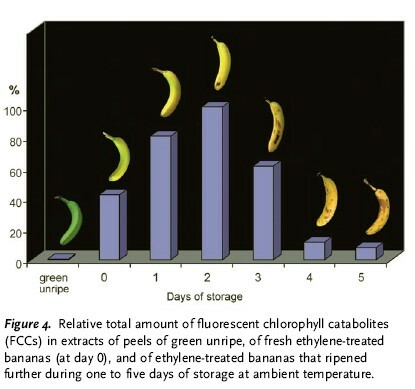 from Nick Turro and others: Blue Luminescence of Ripening Bananas. Angew. Chem. Int. Ed. 2008, 47, 1-5. The figures are deliciously entertaining! This Science paper has no figures. Surprising, with words like “Illusory Pattern” in the title. 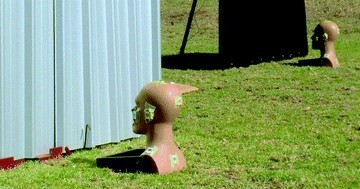 But I truly appreciate that, if they didn’t need one, the authors decided not to waste space with a superfluous image. I commented a while ago about the Hirsch h index. In fact, it was one of my first posts 2.5 years ago. Since then, the h index has become the standard in reporting the extent of an author citations. ISI and ResearcherID report h index along with total citations, and scientists have started to include their h value on their CVs and resumés. But there’s still the problem of self-citation: citing ones own papers in later papers or reviews can increase ones own h index. I now introduce a modification of the Hirsch h index to solve the self-citation problem. The “h-bar index.” The math is very simple: because each researcher cites himself or herself multiple times in each paper, total citations must be divided by a normalizing constant to account for these self-citations. Therefore an author’s index is his or her h index divided by 2π. The table above compares the Hirsch h index and the Lord index of the same scientists I listed in my original post. I argue that the Lord index is a more accurate measure of an individual’s true citation record. There’s a lot of buzz about Doug Prasher not winning the 2008 Nobel in Chemistry with Tsien, Chalfie, and Shimomura. Prasher was the first to discover and clone the gene for GFP, which made most of the subsequent work possible. Here’s an NPR story about Doug Prasher and his story. In my view, the main story is not that Prasher didn’t win the prize (the Nobel committee had to make a decision), but that he is now a bus driver because he cannot get a job in science! What country is this!?! The country that funded great scientific and technological advances (from the atomic bomb to the internet, from the semiconductor transistor to the Hubble telescope). Where is America going when we don’t fund our best scientists (to say nothing of the mediocre ones like me)?